The shooting genre had come a long way since the striking success of Space Invaders in the late 70s. However, by taking its two-dimensional aspect and adding another action plane Sega was able to create a new subgenre with games like After Burner, Galaxy Force and Space Harrier. Though not perfect, this new subgenre mimicked the feeling of immersion in a 3D environment by providing a zooming effect cleverly conveyed by sprite scaling. What results from this approach is pure gameplay from start to finish. In the case of Space Harrier, it's as simple as it gets: shoot, dodge, kill enemies. No power-ups, no speed-ups, no special alteration of any kind except for a single extra life registered once a certain score is achieved. Much like its original arcade mold, Space Harrier on the PC Engine belongs to this unique category and makes no concessions with its absolute lack of continues. Just a single option exists, one that’s used to reverse vertical controls, but since our avatar is a man who flies around carrying a plasma cannon, reversing verticals doesn’t feel natural for me. Natural is more an adequate word for the way the PC Engine is able to handle this great little port. It's a solid demonstration that this system is far beyond 8-bit specs even though many people put it in the same category of the NES and the Master System (as if it didn't go head-to-head against the Mega Drive and the Super Nintendo back in the day). Of course there were some concessions in the porting process, such as the absence of the checkerboard floors, the scratchy voices and the reduced (albeit solid) amount of frames per second, but otherwise this version of the game is a very faithful representation of the arcade original with overall great colors, a decent soundtrack and spot-on sound effects. 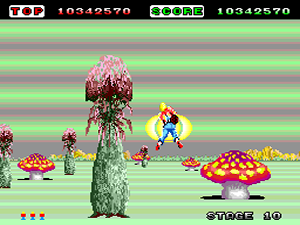 In the no-frills universe of Space Harrier, the lone hero must fly through 18 levels while dodging all sorts of terrain obstacles, avoiding enemy fire and taking down hordes of drones, orbs, robots and strange creatures. I like to think of it as a game that demands players to dodge two kinds of bullets: the first one is the single aimed enemy projectile that's best evaded by always being on the move; the second one is the stationary obstacle that approaches at varying speeds (and sometimes varying heights), to which careful positioning works best. The mix and overlapping of both, as well as their increase in speed and density, is what defines the challenge bestowed upon all brave players who want to see the game to the end. And it's a tough one, yes, but in a way that rewards memorization. All flying enemies, for instance, arrive in the very same manner. And while many stationary obstacles can be properly destroyed, they are all randomly generated. Going around them to get fast, clean kills of incoming waves is key to survival, but sometimes that's just not possible. Pushing the odds might lead you to a painful death with the characteristic agonising Harrier scream. And I might be wrong here, but I had the feeling that those dreadful marble pillars are a little bigger and more numerous in the third half of the game. Or maybe it's just the reduced frame rate that makes things a bit harder, I wonder? 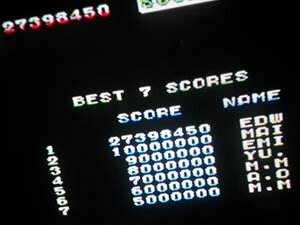 Five million is the score you need to achieve to get a life extend, which generally comes before the first bonus stage. There are officially two of those, but we can also consider the last stage another bonus of sorts since it's just a repetition of a few selected bosses. Stages 16/17 are the hardest ones to survive, so once you come out of them into the final level the clear is pretty much guaranteed unless you mess up badly. After all, bosses are definitely the easiest parts of Space Harrier. And in the grand scheme of things the absence of a proper end boss is kinda disappointing. While not mandatory, a turbo controller definitely helps here. The absence of autofire becomes less stressful as you learn the game and come to terms with the enemy routine (note how the fired shots bend a little in order to hit nearby targets, an aspect that's duly preserved from the arcade version). Strangely enough, I couldn't find a way to consistently get good results while riding the giant creature in the bonus areas, something seems off with the directionals there. As a final token of care from the team who handled the port, once the game is beaten a brief epilogue /epirogue/ text gives some closure to the adventure and sets it apart from the original story that happened in the famous Fantasy Zone. Dragon Land is where the action takes place on the PC Engine, in a battle to free the planet from death and devastation brought about by a mad ruler called Wi Wi Jumbo, the stage 17 boss. Yep, no kidding. Wi Wi Jumbo is his name. My 1CC high score for Space Harrier on the PC Engine is below. Next in line in the port gallery is probably one of the Master System games or the exclusive special version on the Playstation 2.